"CI-3B believes that the Weizmann Institute is an academic organization which conducts research in high-technology issue areas, including theoretical aspects of nuclear and conventional weapons development." 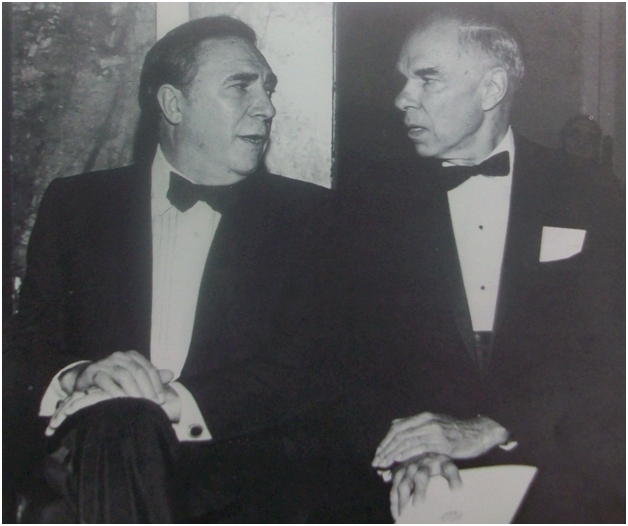 Abraham Feinberg (left) and Glenn T. Seaborg at the Weizmann Institute of Science annual dinner held at the Waldorf Astoria in 1971. David Ben-Gurion appointed Feinberg to be Israel's North America nuclear fundraiser in 1956. In 1970 Feinberg became the chairman of both the Weizmann Institute in Israel and the American Committee fundraising branch in the U.S.. Glenn T. Seaborg had just resigned as the commissioner of the Atomic Energy Commission. The Weizmann Institute began operations at the close of WWII under the direction of Israeli nuclear weapons research pioneer Ernst David Bergmann. It is named after famed chemist Chaim Weizmann, a Russian who immigrated to the UK and revolutionized the production of acetone needed for gunpowder production in WWI. The Zionist activist lobbied and charmed Lord Balfour during the drive for the creation of a Jewish state in Palestine and became Israel's first president in 1949. Abraham Feinberg, a Democratic Party operative and David Ben-Gurion's designated North American nuclear fund-raising coordinator, began courting Nobel laureate Glenn T. Seaborg on behalf of the Weizmann Institute in the early 1950's. After becoming head of the Atomic Energy Commission under JFK, Seaborg played a key role in derailing warranted AEC and criminal investigations of the NUMEC uranium diversion in the 1960s. Upon leaving the AEC in 1971, Seaborg accepted Weizmann Institute chairman Abraham Feinberg's invitation (and an honorarium equivalent to nearly 10% of his annual salary) to keynote the annual Waldorf Astoria event. Seaborg's speech reaffirmed a new US policy of covering up Israel's arsenal. "During my tenure as Chairman of the AEC I was asked on numerous occasions whether I thought Israel was a nuclear power—or less euphemistically—did she have the bomb?...Now in retrospect, I often wished I had said, 'Yes, she is a nuclear power, the kind that knows of, and makes use of, the atom's power for peace.'" After the NUMEC uranium theft diversion investigation was reactivated in the late 1970s, Seaborg refused to talk to FBI agents after DOE officials told him NUMEC u-235 was recovered in Israel. In October of 1992 personnel at the Yuma Proving Ground, which tests nearly every significant ground combat weapons system, detected a University of Buffalo computer system user had penetrated their military computer network via New Mexico State University. The senior majoring in Chemical Engineering hacked the UB system to obtain high-level privileges using access codes stolen graduate students. Soon after the BU hack "computers from the Weizmann Institute for Science accessed computers from NM SU to penetrate computers at YPG." FBI investigators suspected the BU student, arrested by Amherst Town police on October 8, 1992, passed the secret access codes to Weizmann. FBI counterespionage officials uncovered Weizmann's clandestine nuclear development role and US funding network, but closed the investigation. 133 KB 3 pages FBI FOIA release letter. 1.3 MB 33 Pages Censored affidavits, March 11, 1994 investigative summary, censored information on subpoenas in New York, review by National Computer Crime Squad (NCCS). Material referred to other government agencies for review and release. 567 KB 10 Pages Referrals to Counter Intelligence Division, hand carried envelopes. In accordance with Title 17 U.S.C. Section 107, this material is presented without profit for research and educational purposes, most importantly understanding how government functions during law enforcement actions involving Israel and Israel lobbyists. The Israel Lobby Archive has neither affiliation with the originator of the content nor is it endorsed or sponsored by the originator. Information appearing in [ ], hyperlink, or otherwise noted is provided to clarify events, identify individuals, or correct spelling. Non-Israel Lobby Archive hyperlinks are for additional reference information.